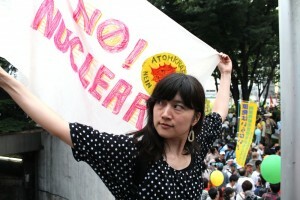 You asked me about how the Japanese anti-nuclear movement has gone since August. It is difficult for me to be precise because too many things have happened. I’m going to respond to your questions by simply talking about what I know. I could be wrong with the names I’m going to mention below, or could be wrong chronologically. But anyway, I try to refresh my memory. Since you left Japan in August, there have been various anti-nuclear actions. As a demonstration, on September 11, a demo called “Genpatsu Yamero Demo,” or “Stop Nuclear Power Plants Demo”, which was led by Shiroto no Ran (Amateur’s revolt) – you are already familiar with this name – took place. Many people showed up, but the police’s brutality was harsher than ever before. The protesters couldn’t move in the way they wanted to. It was unusually tense, while the police over-regulated us, ordering us to keep a certain speed to walk, allowing us to walk in a very thin line, preventing bystanders on the sidewalk from joining us. Eleven people were arrested – unjustly, of course. It eventually became the last demonstration led by Shiroto no Ran in 2011. Shiroto no Ran got stuck due to the police brutality on September 11, but there have been various active groups: Twit No Nukes (so-called “Twitter Demo”, led by Hirano-san); NO NUKES MORE HEARTS organized by Misao-san – this group has already been active before 3.11; those traditional groups such as Gensuikin, an anti-nuclear weapons organization; “Drums of Fury”, a drum circle in which Illcommonz-san is also involved, organized by Minoru Ide-san. Every weekend in Shibuya, Shinjuku, or in front of TEPCO headquarters, they have rallied. They’ve rallied not only in central Tokyo, such as Shibuya, but also in western suburbs such as Tama area and Kunitachi City, and in other prefectures, such as Saitama and Kanagawa. While many people take themselves to the streets, the others appear to (at least vaguely) think that the nuclear disaster is ‘over.’ It is probably because the government and the mass media manipulate us by hiding the information, and also because the majority of those people who want to forget about all of this don’t take the environmental and food contamination seriously. In December, Prime Minister Noda declared that the Fukushima accident came to an end. But considering those spreading health problems and food contamination caused by radiation, and those people in Fukushima who cannot return home, Noda is too irresponsible. The declaration means his abandoning of his responsibility. I’m furious, imagining that those who are involved in the nuclear industry are popping a champagne cork, and also afraid that in fact the people think the accident and contamination is ‘over’, accepting the authority’s story. People are increasingly divided between those who think things are ‘over’ and those who take the danger of the ongoing contamination and nuclear power plants seriously. There is a hope, however. It appears that the grassroots movements including those demonstrations every week have become socially accepted. While some bystanders still dislike us, I feel that what we are doing has increasingly become recognized. The public is no longer as scornful as it was. It may be because they’ve got used to it, or because I’ve become strong, or because I’ve been toughened up so I’m no longer sensitive…I don’t know. Demonstrations are no longer means of some special people, but of those who have never taken themselves to the streets before, including mothers, fathers, and children. The ordinary people have reclaimed it as their means of political expression. So, there is a hope. I believe that direct political actions are the key for the people to reconnecting their lives and culture with politics. Facing the unprecedented disaster in human history, Japanese people are now tested – whether they can create a truly better way of living by their own hands. In this sense, 2012 is crucial. Keeping my hope alive still, I’ll face all the difficulties. Now I’m not alone. I have friends who are striving with me. Julia, you are one of them. RADIOACTIVISTS, created by Julia and Clarissa, will connect all of us who are against nuclear power plants. Thank you for your shooting this film. Thanks again. By the way, since the exhibition called ‘Atomic Site’, which took place in August at Contemporary Art Factory in Tokyo, those artists have worked separately. In February they will reunite. I cannot wait for watching what those angry artists will bring up to then. I’ve recently started a collective activism called ‘Bohemian Punch’ with the friends I met at various anti-nuclear demonstrations since 3.11. It’s a sort of working group that creates flags, instruments, and performing arts in order to make our voice louder. This anti-nuclear movement has to last long, so I try not to get exhausted, but I’ll do whatever I can do. I’m looking forward to meeting more inspiring people.